This week my husband and our 3 other dogs said goodbye to Pepper, our precious fur-child. We're grieving the loss of our dog, our pack member and our dear friend. Perhaps you saw Pepper (aka Peppy) in our videos, live broadcasts or family pictures. He was often the best behaved of our pack so he would be invited to come along to our classes and other Sama-dogly activities. Undoubtedly, many of you reading this can relate to this virtually unexplainable feeling of loss; the waves of emotion which are passing through the mind and body. All the while, this huge emptiness lingers heavily on the heart. Just yesterday he was here. Today he is gone. It was as if he just vanished, yet I can still feel and smell him here, laying just behind my office chair. Peppy immigrated to San Diego from the Philippines in early 2015. He was a street dog from the islands, totally mistreated, diseased, starving, skittish. After being rescued in Manilla by a compassionate animal angel named Nancy, she worked with Tanya through CARA Welfare Philippines to get him the treatment and safety he desperately needed. Pepper was then chaperoned to America by our dear friend Rebekah, a woman who served in the Marine Corp and would spend ALL her leave time volunteering at the local animal shelters. This great journey and all of his medical needs were sponsored by our close friend Cassandra at Wagging Dog Rescue here in San Diego. It took a whole team of devoted animal saviors to get his 25 lbs of sweetness to the other side of the planet... and into our hearts. He originally came to our home as a foster dog but we soon learned that Peppy had health challenges such as kidney disease and some kind of nerve pain, all of which wouldn't make a standard adoption possible. Although it took us a month to merely lay a single finger on him as he was so fearful, it took him no time at all to wiggle his way deep into our heart and soul. All of us in the house — human and canine — seemed to enjoy his extremely gentle demeanor and peaceful buddha-like presence, so we invited him to join our pack and family permanently. Pep never demanded a thing. He was endlessly grateful. All he wanted in this world was to be near you, enjoy some good food, a walk in the park, and bear witness to it all. The past few months were often difficult and painful for Pep. Yet the guy never complained once, always expressed his appreciation for being taken such good care of, and kept engaging in family activities the best his failing little body would allow. Just as our little guru showed us how to live, he also demonstrated how to die. With total surrender, when his body just couldn't hang in there anymore, he let go and allowed the process which will eventually happen to each and every one of us. He left his body. On the morning of his passing, I woke up with a vivid message to meditate with him. We practice daily together, but I knew this meditation had to be deliberate and important. I held him close to me, my husband Rene and the other dogs right there with us, and we told his story again. We reminded him of the help and love he received by people around the world. 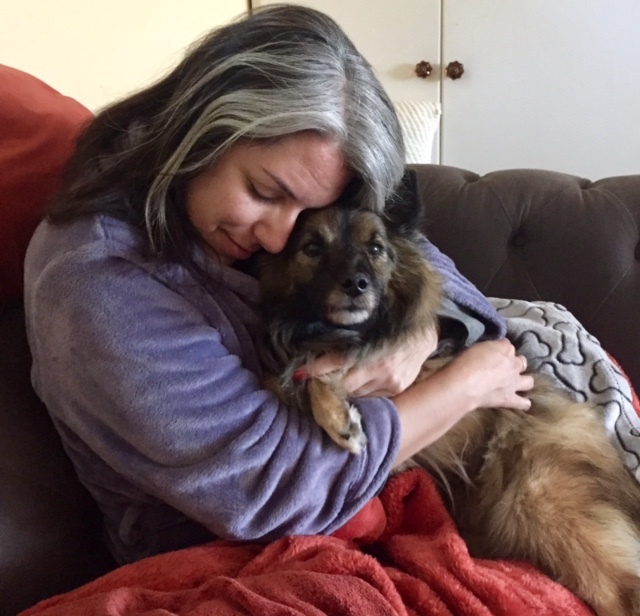 We reflected on many of the wonderful memories we shared... the multiple other foster dogs who had come and gone through our home, and his amazing transformation from a distant, fear-filled dog to golden-hearted cuddle bear. We reminded him that it was ok to make his way back home; although we would miss his presence terribly, our souls would be together eternally. Our family shared an extra long and deep meditation that day. Peppy was peaceful and settled, significantly different from the previously restless and uncomfortable energy resulting from his illnesses. Although we didn't think Tuesday, March 28th was the day he would leave us, he must have received our messages loud and clear because within 90 minutes he decided it was time to go. Pepper taught us to be grateful for the things we get, always and without fail. Each morning and evening, despite his watering mouth and eagerness to eat another delicious meal, he'd quickly look at the bowl — then look up to meet our eyes to give appreciation and acknowledgement — then proceed to eat with full gusto. I could literally hear the words "thank you" each time he'd do this. He was always grateful for the gift of nourishment. Every dog has their unique love language. Peppy loved receiving gentle kisses on his head and he especially loved laying on his back, cradled by my legs, to enjoy a thorough doggy massage. It took a while for him to get comfortable and learn to trust, remember he was an abused street dog after all, but once he learned that he was safe with us, he totally surrendered and soaked it all in. Are you aware of your dog's love language? This connection alone can be an incredibly healing force. Cassandra from Wagging Dog Rescue wrote this beautiful article about Pepper, click here to read it.